8. Wheat ear stitches and pistil stitches are worked into knotted feather stitch rows in this sample. 9. Algerian eye stitches are worked along the knotted feather stitch row here. 10. 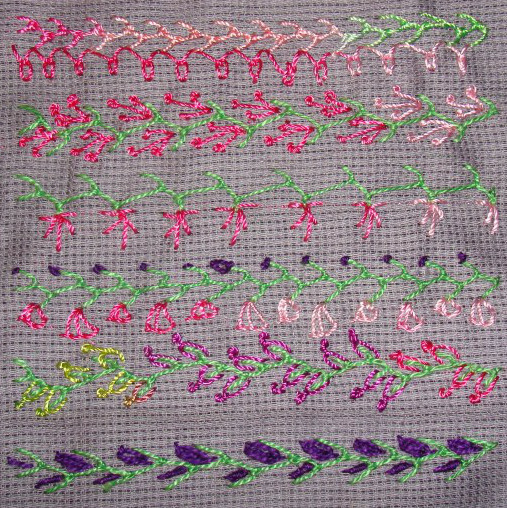 Knotted feather stitch, with french knots and buttonhole wheel variation in the first row, and Italian border stitches in the second row. 11.this last row of knotted feather stitch is worked with oyster stitches and bullion knots. This was an interesting stitch to work. Makes a beautiful decorative seam. Creates possibilities for using other stitches. I enjoyed working on this sampler. 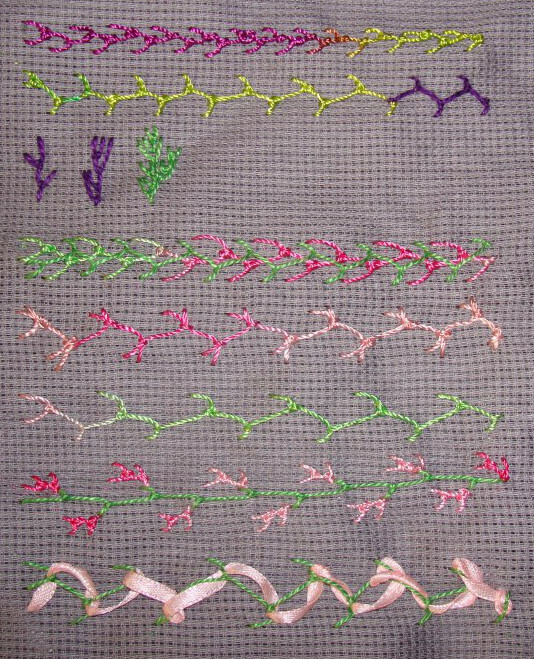 1.Berry stitches are worked on the knotted feather stitch in the first row. 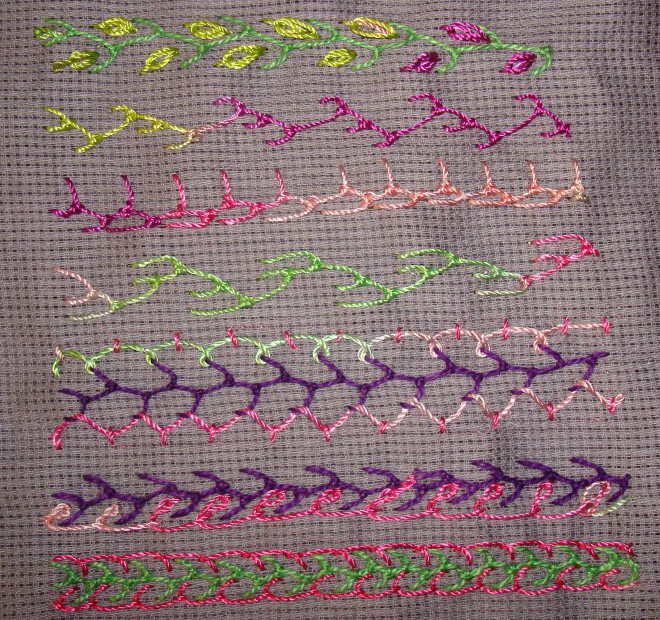 Two variations of knotted feather stitches are worked in the next two rows. 2. Knotted feather stitch is worked in two steps in this row. 3. Pekinese stitch is worked with this stitch in the first row, the thread refused to twist in the bottom part.LOL! basque stitch is worked with this stitch in the second row. 4.buttonhole stitches are worked on both sides of knotted feather stitch in this row. I am back to blogging after a five weeks. I missed the first two stitches on this year’s TAST 2013 stitch challenge by SharonB on her blog. I have not done this stitch before, though feather stitch and knotted Cretan stitches have been attempted before on previous challenges. Since, I want to add to my stitch sampler collection, this is also a band sampler. Some attempts were made on this sampler today. The sampler looks like this now. 1.First row is the practice of this stitch, and the second row is a variation. I tried some motifs and abandoned this idea . 2. feather stitch is worked over a row of knotted feather stitch in the first row, up and down feather stitch worked with knots in the second row, one side of the stitch is worked with knots in the third row. 3.two knotted feather stitches are worked over a row of knotted feather stitch variation in the first row. Knotted feather stitch is laced with satin in the second row.